Ancient Jericho: Tell es-Sultan is part of the Tentative list of Palestine in order to qualify for inclusion in the World Heritage List. As is appropriate for what is claimed to be the World's earliest (known) walled city Tell es-Sultan (better known as “Jericho”) has been nominated for our list of "Top 50 Missing" sites. It also of course has significant Biblical associations – Joshua and all that. I first visited it as long ago as 1964 but only remembered a sandy hill with a mishmash of excavated pits and stones which I couldn’t really understand – there were no interpretation boards in those far off days! So I have long wanted to re-visit it to gain a better appreciation. The politics since those days have seen it pass through several changes of governance from Jordan, to Israel in 1967 and then in 1994, following the Oslo Accords, to the Palestinian Authority. At that point great things were hoped for from both Israeli and international tourism. As a result, significant investment took place to develop an infrastructure to handle the expected large numbers of tourists in the form of a cable car, hotels and a casino. The Second Intifada saw those initial hopes dashed however and today the city of Jericho sits as rather crumbling Palestinian enclave defined as a Category A area - ie under full Palestinian control and into which no Israeli citizen is legally allowed, but totally surrounded by Area C still under full Israeli control. The main sites still receive a fair number of international tourists but these largely arrive as tour groups visiting fleetingly as part of a larger tour to the Dead Sea etc and spending little to benift the local economy. Strictly, I think we were not supposed to take our Israeli rent-a-car to the site but, having contemplated leaving the car at a gas station on Highway 1 a few kms south of Jericho and taking a taxi from there, I decided to take Highway 90 north round the east side of Jericho and turn off directly into the north of the city where both the Hisham’s Palace (another site which is well worth seeing whilst you are nearby) and Tell es-Sultan are situated. There was no border checkpoint (only the big notice telling Israeli citizens not to enter) and the 2 sites were only around 2-3 kms in (and well signed). Unfortunately the rather isolated frontier didn’t seem a particularly safe place to leave a car unattended whilst one walked in, either all the way or to get a taxi (there was very little passing traffic on the Friday pm we were there) so we drove in all the wway! Ours wasn’t the only Israeli “international rent-a-car company” vehicle which did this but you would have to make your own decision! As you enter, you immediately experience the change in status compared with the well ordered sites run by the Israeli Nature and Parks Authority which you will have become used to across the border. The area is imbued with incompetence, under-funding and desperation even. In the car park you will be regaled by touts and, at the entrance desk, getting the attendant to play the introductory movie is like pulling teeth. Within the site, the paths and boundary ropes are badly maintained and the buildings of Jericho crowd right up to the site boundary – how a buffer zone could ever be established I know not. And, as you climb the Tell, you see above you the cable car gondolas passing directly over the site on their way to the Mount of Temptation. The Oriental Department of the “La Sapienza” University of Rome has been carrying out a long term project at Tell es-Sultan covering both digs and preservation/presentation work. See http://www.lasapienzatojericho.it/ . So, despite the other presentational weaknesses, there were information signs within the site as per the design of the map in the “Digital Visit” section of the La Sapeinza Web site above. A visit follows the green path of that map, but only 3 features are of really of note – those for numbers 8, 12-14 and, above all number 1. 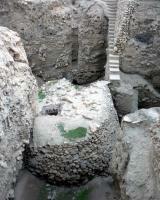 This, the Neolithic tower and town wall, is really the “piece de resistance” of the entire site (Photo). It of course considerably pre-dates Joshua and any walls he may or may not have been involved in getting to “tumble down”! The discovery of this tower (One of the World’s earliest stone built monuments) by Kenyon during the 1950s many stratigraphic levels down in “Trench I” was a major archaeological discovery which rewrote the archaeology of the Levant and, in so doing, of the World. And what of Joshua? He would have been from the Late Bronze Age around 1300BC – whilst this tower is thought to date back to around 8000BC. There are still many theories about the tower, as there are indeed about what Jericho would have been like at the much later time of Joshua and whether there is any evidence at all of a battle around that time. Kenyon, having proven Jericho’s great antiquity, also concluded that the site would have been deserted at the time of Joshua’s conquest of Canaan. This view continues to be the subject of revisionist thinking! But for me, merely the view of that tower alone made the journey worthwhile – I thought I could “remember” it from almost 50 years earlier but was I just “remembering” photos of it? To have had the good fortune to visit my 4th great 20th century Archaeological site across just under 8 weeks (Taxila, Moenjodaro, Megiddo and Jericho) was very satisfying – though those of you less interested in Archaeology may somewhat under-whelmed by what is on show at Tell es-Sultan!